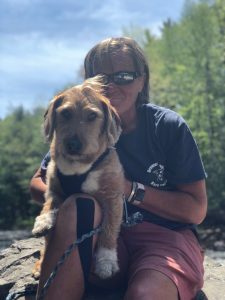 Bangor Pet Resort and Spa is well known in the Bangor area for providing exceptional care to man’s (and woman’s) best friends. Their services include an interactive pet daycare, comfortable overnight boarding and luxurious spa and grooming services. Their clean and comfortable facility features spacious play areas for group play time as well as as private rooms with windows for dogs that want to be by themselves. Overnight guests receive their very own pet suites or condos, with all the comforts of home and more. Certified groomers are also available to brush, trim and pamper your pet. When the owner was looking to retire, he did not have to look far to find a suitable candidate to carry on the business. Sarah Smith, an employee for almost seven years, was a natural choice. During her time at Bangor Pet Resort & Spa, Smith had fallen in love with working with animals and had been promoted to manager. She saw an opportunity to own her first business and settle into a role she knew she would love, but was unsure where to begin. She had started discussions with the current owner, but needed non-biased help. Smith turned to the Maine SBDC for assistance with this overwhelming goal. Working with Business Advisors Shannon Byers and Ann McAlhany, Smith sought advice on how to evaluate the business and negotiate a price; what steps would be needed to complete the process of purchasing the business; and how to transition to being an owner. They worked through her business plan and her financials in order to secure financing to purchase the business. After nine months of hard work, Smith is now the proud owner and operator of Bangor Pet Resort & Spa and has had a successful transition. She comments “Being in this position would not have been possible without support, advice and guidance of SBDC”. For more information on this growing Maine business, visit their website or follow them on Facebook!